We hate to brag, but this is another crowd pleaser. It's one of our cooking demo favorites, and before our cookbook came out this was the recipe that our friends requested most often. If filet mignon seems a little fancy for your backyard cookout, try the rub on skirt steak or flank steak. This brings the flavors of Spain home, while paprika and cayenne spice up your steak on a hot summer night. Mix the oil and dry ingredients in a small bowl or glass measuring cup. Spoon a small amount of the paste onto the top of each filet, spread, turn over, and repeat on the other side. Marinate for 4-24 hours in the refrigerator. If storing more than a few hours, cover with plastic or place in a plastic bag. Cook under hot broiler or on the grill for approximately 4 minutes per side for a 1-inch thick steak, add 1 minute per side for each additional ½ inch. 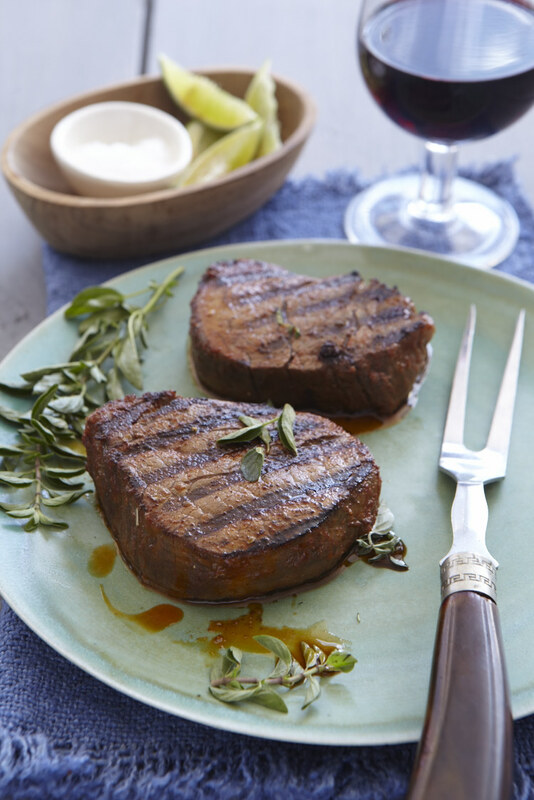 Tip: For uniform, round filets, shape the steaks and tie each with a piece of kitchen twine before rubbing, and remember to have sharp scissors handy to remove the twine before serving. Marques De Riscal Reserva, Tempranillo, Graciano, Mazuelo, Rioja, Spain: This traditional Riojan blend stands up to the strong spice of grilled meat. Roda Reserva, Tempranillo and Graciano, Rioja, Spain: More modern in style, this full bodied red has notes of ripe red cherries and aromatic herbs.